The buckle on Tucker's car seat broke a few weeks ago. Please don't ask how long we waited to replace the dang thing - his grandparents would be horrified. In an effort to save a few dollars, I started by replacing it with one of those belt-positioner booster seats that uses the seat belt from the van. He'd been in the seat for five minutes when he was literally either 1. laying in Zoe's lap or 2. sitting on his knees playing with the reading light. It was a nightmare. I yelled from the front seat, trying to get him to sit correctly (i.e. safely) while I was driving on the highway, fending off images of crashing while doing 70mph. I lost track of how many times he was able to unbuckle the belt altogether. It took less than 48 hours to replace the seat again but the damage had already been done. He had tasted his freedom. He knew what it meant to have a lap belt and the ability to tuck the shoulder belt under his arms. He had seen the grass was greener and ran through it with bare feet, his hairpiece flapping in the wind. Needless to say he now screams when I click the harness at his armpits and snap the metal pieces into the lock between his legs. I took away his newly found freedom, Lord forgive me. The funnel gives us a great picture if we start at the bottom and work our way to the top, through the mindset of freedom & authority. We tend to think that we can give our littles lots of freedom - think iPhones and iPads, the clothes they choose to wear, their ability to navigate the climate of the home, and their overall decision making and control over their environment. My two-year-old is ornery and troublesome when we grocery shop so I give him the iPhone. He plays little kid games or watches videos on the PBS app. I have peace of mind and can focus on my grocery list. Which is unfortunately in my Notes on the phone so I have to interrupt him every 5-6 minutes. When he turns five, he's learned mainly that he doesn't have to actually behave at the store and wants to ride around in the cart. He's big enough to be bored with kid apps and wants to play more aggressive and entertaining games, which usually cost money and eat up my data. Fast forward to ten, he expects to have his own iPhone, can Google any term he learns on TV, and legitimately doesn't understand when I try to enforce boundaries with technology. My daughter tends to be strong-willed around the age of three or four when it comes to picking her outfit for the day. I'm tired of the battles, hate having to say "no" again, so I let her choose whatever she wears, while silently being more than a little annoyed at her control. She's outgrown the toddler section before I can say "modesty" and then she's telling me exactly what she wants in the junior department. She's a teenager and earning her own money so she's buying stuff at the mall and then I try to explain why the miniskirt and low-cut tank top aren't appropriate for the Sunday service. Now the dreaded "c" word: chores. My kids aren't required to do much around the house when they're developing their work ethic, between ages 3-5. Mom does all the laundry, clears all the dishes, loads and unloads the dishwasher, while we hope the kid knows how to make his bed and change his underwear daily. Until the day where a couple days' worth of outfits takes up a whole load in the washing machine and I'm drowning in Downy and fluffing the contents of the dryer again. I battle with them over putting their clothes in their laundry basket and try to keep their attention for the 90 seconds it takes to learn how to start their own load. It is easier to maintain control (authority) than regain control (authority). 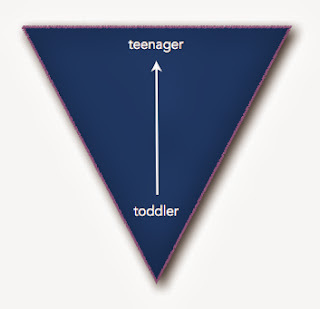 Let's flip the funnel and talk about how we can practically implement boundaries in the same scenarios so that we give our kids more control as they get older. It's hard to grocery shop when you're a toddler who hates the grocery cart. But Mom brought some books, and maybe even has the foresight to print off two lists and bring a jumbo crayon so baby can help with the list. Discipline problems in aisle seven take priority over the peas melting and the sweet little cherub learns that he cannot control Mom and her responsibilities. His little fingers get flicked behind clothes racks and he might cry but Mom is confident in her methods. When he's getting ready for first grade, he picks items off the shelf at the store and helps place cans on the belt in the checkout line. When they get home, Mom and boy will sit down on the couch together for ten minutes and play one of the new educational apps she found for free. They'll snuggle while learning and he'll have a little bit of freedom, but think that he's gotten the world of it. Technology is a privilege - not a right and certainly not a behavior modifier - and this will lay a phenomenal foundation for the years to come. Until the age of 3 or 4, I pick out the diva's clothes. I lay them out, I make sure the tags don't bother her, and we thank God for providing us with such pretty things to wear. When she turns 4, she can choose from two outfits that Mom picks out. She is empowered to make the choice herself but Mom is setting the boundaries. By age 8 (maybe sooner for most), she can pick her outfit out and bring it to mom for approval, maybe with the exception of special events. She doesn't know any different than getting Mom's okay with what she wears and how she presents herself to the world. We cultivate a heart of modesty and thanksgiving when we realize that God provides everything for us. At age five, the boy is unloading the silverware and the girl, age eight, is unloading the dishwasher. The girl knows how to fold everything in the dryer and can put clothes in their place. They work together to scoop the poop in the backyard. The toddler gets to have a lot of fun with the vacuum and is learning by example that everyone participates in running a home, that chores and work are a part of life, and that "jobs well done" honor everyone. We talk often about complaining and having joy in the midst of things that aren't fun. The expectation is built early that we all contribute - it's really just the norm. So when my boys are big enough to eat four plates of spaghetti, they'll be able to mow the yard and clear the table with the ethic of grown men who find pride in their work. 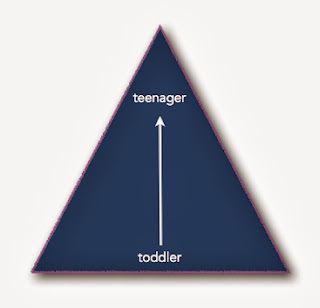 Parenting is like our car seat problem. We absentmindedly give our kids freedom and do what feels easy for us - cheaper - less stressful - keep them quieter - avoid battles - etc. etc. - without realizing that we're giving up our authority over their lives. Once we realize that things aren't the best for them or the family structure, we try to put them under tighter restrictions and they scream, rebel, whatever. When these things seem hard I try to imagine giving my teenagers more authority and trust their decision-making. I picture fewer arguments and battles over what to wear, how to clean, without being naive that, of course, we'll have disagreements and tension. But I like to think of this as an investment, a sowing of sorts, where we will reap a harvest of responsibility. We'll have kids who appreciate their control and decisions, and don't demand it. This path requires hard, hard work. Firmness matched with kindness is a difficult skill but this kind of parenting will create healthy relationships in our homes and usher in a kind of peace that comes with the protection of boundaries. If you're already on the wrong path with all this stuff, don't be afraid to look squarely at your habits. Take a quick and honest assessment of your coping techniques. Are your kids in charge? Are you relying on all the wrong stuff because the alternative is just too hard? Don't dismay - be thankful that you can make changes, whether you have a toddler and a newborn or kids in elementary school. Get a plan and make small changes. Set your kids up for success and don't get bummed out when you fail. Think long-term goals and apply short-term habits. You can do it. Buckle your seatbelt and let's ride this thing together!